Camden People - Samuel J.T. French Sr.
SAMUEL JONES TILDEN FRENCH SR. was born January 23, 1877 to William Nelson and Mary Caroline Collins French. He was a great-great-grandson of American naval Captain Micajah Smith, of Chestnut Neck, on Little Egg Harbor in Atlantic County NJ. Captain Smith brought in the large British freighter Venus, of London, in August, 1778. This and other American activities in and near Chestnut Neck brought about a British attack, which was unsuccessful in the first week of October 1778. This became known as the Battle of Chestnut Neck. Samuel J.T. French Sr. was named for the 1876 Democrat presidential candidate Samuel J. Tilden, who had lost the election to Rutherford B. Hayes in 1876 due to electors from Florida switching their votes when the Electoral College was convened. The 1880 Census shows the family living in Atlantic City NJ, where the elder French was working as a huckster . Early in 1888 the French family moved to Camden NJ, and lived at 212 South 5th Street. During the late 1880s and 1890s William N. French was in the produce business, while oldest son William Collins French is recorded in the city directories as a clerk. Samuel J.T. French Sr. graduated from Camden Manual Training & High School. This school was renamed Clara J. Burrough Junior High School upon the opening of the present Camden High School. Both he and his brother were fine athletes, playing football for the Camden Athletic Association team, which which played its games at 3rd and Erie Streets in North Camden. 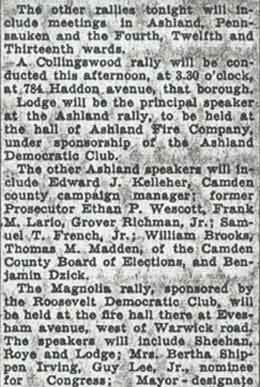 The French brothers' teammates included future Camden mayor Frank S. Van Hart, Tom Peterson, George Bergen, and Martin Bergen. The two Bergens would also become noted lawyers in Camden. After graduation from Camden High, Samuel J.T. French followed older brother William's example and studied law. By the time the 1920 Census was taken, Samuel J.T. French Sr. had established a successful legal practice in Camden with older brother William. One month short of his 43rd birthday, Samuel J.T. French Sr. was well respected by government leaders of both parties. Besides his law business, he served as the president of New Jersey's first Delaware River Bridge and Tunnel Commission, the group that eventually evolved into that which arranged for the construction of what today is called the Benjamin Franklin Bridge. When the census was taken in January of 1920, Samuel French and his wife Alma had owned their home at 513 State Street in North Camden for seven years. The French family then included sons Nelson, Samuel J.T. Jr., and daughter Lillian. Another son, Richard French, would arrive later. 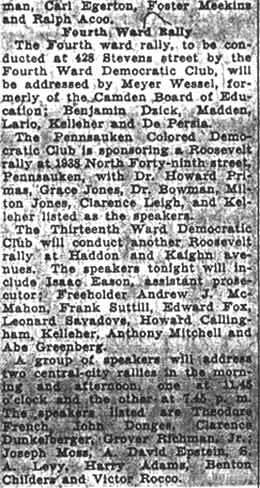 By April of 1930, when the next census was taken, Republican Congressman Charles A. Wolverton and family had bought a home at 505 State Street in North Camden. Samuel J.T. 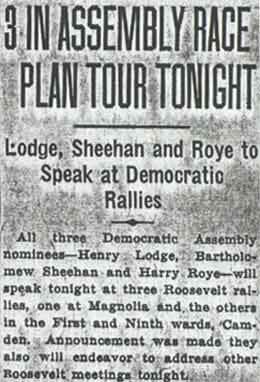 French Sr. ran unsuccessfully for Congress as a Democrat against Wolverton in 1932, which must have been interesting, as the two candidates lived only six doors apart at the time. The Wolverton's only son, Donnell, would, like Samuel J.T. French Jr., follow law as a profession in Camden. Sadly, Sarah Wolverton would pass away in 1938. 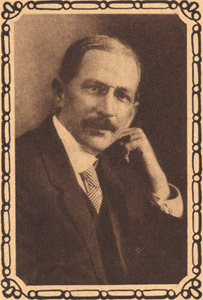 After serving as a judge, brother William C. French passed away in early 1930. Shortly afterwards son Samuel J.T. French Jr. joined his father in his law practice. 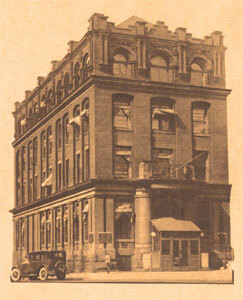 The firm, with offices at 305 Market Street, the Security Trust Building, was known as French and French, and would remain at 305 Market as late as 1977. Samuel French Sr. maintained his residence in North Camden throughout his life. He also had a summer home in Port Republic NJ, where he spent much time, for many years. 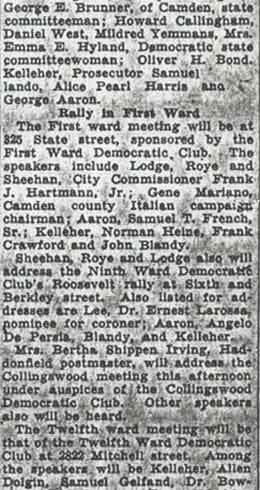 The Eleventh Ward Democratic Club, 923 North Twenty-seventh Street, will be opened formally tonight by Mrs. Emma E. Hyland, Democratic state committeewoman, and Samuel T. French, prominent attorney and worker for the party. Honor guests will be Mrs. Lillian Pisko and Charles Goldy, both mem­bers of the county committee, organizers of the club. Agreeing with the contention that transfer of the Public Service Cab Company to Public Service Coordinated Transport was fraudulent, Vice Chancellor Francis B. Davis late yesterday ordered the latter to pay $10,000 in damages to Ralph M. Chorpenning for injuries suffered by his daughter, Ida M., when she was struck by a taxicab. 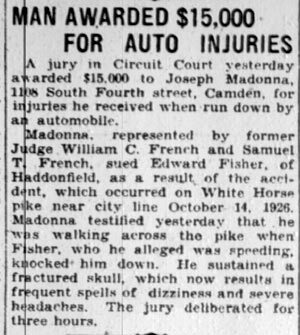 That sum was part of a verdict for $15,000 awarded by a Circuit Court jury in October, 1927 as a result of Miss Chorpenning being injured by a car of the Public Service Cab Company at Twelfth and Federal Streets in August, 1927. Testimony taken by Vice Chancellor Davis showed Chorpenning sued Public Service Cab Company to recover damages for his daughter, then a minor. It was contended the cab company paid $5000 of the verdict but sold out to Public Service Coordinated Transport and never made settlement for the balance. Public Service Coordinated disclaimed knowledge of the judgment and responsibility. Harvey F. Carr and Samuel T. French instituted the action against Public Service in Chancery Court to recover the balance for Chorpenning. Prosecutor Clifford A. Baldwin and Patrick H. Harding were counsel for Public Service. At the hearing before the vice chancellor, Charles Aceto admitted he acted as agent for Public Service in purchasing the cab company from George Falkenstein, general manager, and Phillip Messina, secretary. On the same day Harding, who was counsel for Public Service, was elected president of the Yellow Cab Company, controlled by Public Service Corporation, which absorbed the Public Service Cab Company, testimony revealed. Harding, Mildred Atkins, his stenographer, and Thomas J. Comerford were elected directors. On the stand Falkenstein, who is now garage manager for Public Service; admitted he received $29,000 from Aceto for the equipment and name of the taxi company. Harding admitted he received a fee of $1000. A similar fee was paid Aceto. When questioned before Vice Chancellor Davis on the damage suit, Falkenstein declared he forgot to mention the suit in the settlement. Public Service held it was not liable for any damages awarded prior to taking over the company. "I do not think it is necessary to appoint a receiver for the Public Service Cab Company for the reason there appears to be no creditors other than the complainants within." In another paragraph he says; "It is the contention of the complainants that the transfer of the physical property of the Public Service Cab Company to the Yellow Cab Company was without consideration and therefore fraudulent and void under the Uniform, Fraudulent Conveyance Act. With this contention I agree." Miss Chorpenning, who is now 23, lives with her parents at 2758 Mickle Street.